Home » Lifestyles » Do you have these workplace must haves? Do you have these workplace must haves? Redoing your office interiors? Try out some of the must-have elements in office spaces like the right furniture, adding nature to the surroundings and activity-based settings. Ishan Thacker, Associate Director, Vector Projects (I) Pvt. Ltd. and Amit Ramani, Founder, and CEO of Awfis Space Solutions list some recommendations. * The right furniture: This plays a pivotal role in any kind of workspace setting. Offices need to invest in the right kind of furniture to increase their employees’ efficiency. Opt for something that has high functionality over ordinary designs. Adjustable desks and chairs can be a good choice; multipurpose furniture can also be added to save space. Another new entrant in the space is reconfigurable furniture that can be customized as per need. It provides both the required flexibility as well as privacy. * Go back to nature: Add in a little nature to your premises with biophilic designs. The latest trend in the office space, the presence of plants and other natural elements can add positivity within the environment and improve the air quality. * Activity-based settings: It is exciting to be at a workplace that engages you with diverse group of people and gives you the opportunity to network and collaborate. Flexible workstations, new age cabins, activity-based settings including comfortable couches and beanbags, breakout zones, meeting lounges and pods are some of the attractions in an office that provide a natural crossroad for employees to meet and share ideas, thereby enhancing their motivation levels and productivity. * Ergonomic lighting: Our cortisol level drops significantly under artificial and poor lighting conditions and dimly lit workplaces strain the eyes, causing headache and drowsiness. This can lead to poor productivity. Natural light is the best. Daylight that filters through space not only affects employee well-being but also boosts the energy and mood level. Consider making the best use of natural light and swap the fluorescent bulbs with personal lamps, string lighting, and soft coloured bulbs to keep your employees alert and attentive. * Aesthetic appeal: Everything from layout to furniture and even artwork is subject to appeal in a workplace. The idea is to create a transcendental experience for the user and to design a warm casual space that works as an incubator for ideas. Materials like wood and metal bring warmth and rustic feel to space. 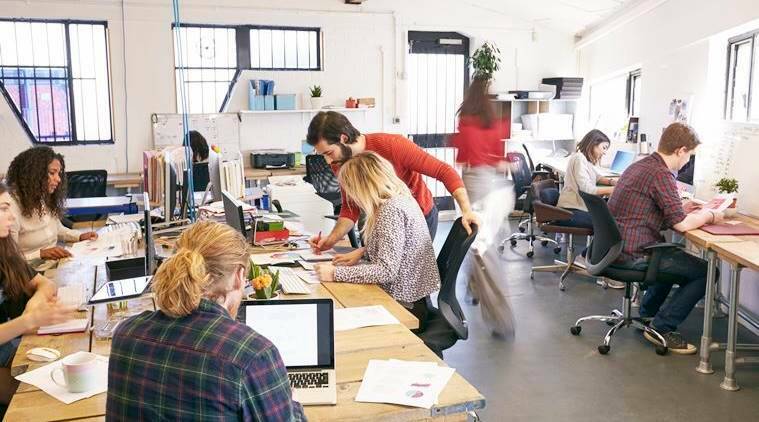 Keeping in mind the fact that the office workspaces today are dynamic in nature and are witnessing rapid changes, the workplace style should be bold, industrial and vibrant with new age materials, technology, and decluttered design vocabulary. * Technology: A modern office space is incomplete without the right technology. Integrated systems, fast-speed internet connections, and latest hardware and software are things your office must have to appeal to the incoming tech-savvy generations. Not only that, an office can also invest in mobile devices or rather agile settings to help one switch easily from one place as to another. The new workforce prefers more flexibility which will, in turn, result in enhanced productivity.